"Concrete revolution" redirects here. It is not to be confused with Concrete Revolutio. 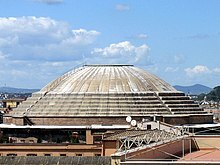 The Roman architectural revolution, also known as the Concrete revolution, was the widespread use in Roman architecture of the previously little-used architectural forms of the arch, vault, and dome. For the first time in history, their potential was fully exploited in the construction of a wide range of civil engineering structures, public buildings, and military facilities. These included amphitheatres, aqueducts, baths, bridges, circuses, dams, domes, harbours, and temples. A crucial factor in this development that saw a trend to monumental architecture was the invention of Roman concrete (also called opus caementicium), which led to the liberation of the shape from the dictate of the traditional materials of stone and brick. For the first time in recorded history we find evidence of an interest in the shapes of the space contained strong enough to outweigh the functional logic of the masonry masses that contained it. There was nothing new in the employment of curvilinear or polygonal forms, as such...But in so far as such buildings incorporated curvilinear or polygonal rooms and corridors, the shapes of these were determined by the form of the building as a whole, not by any aesthetic principle. The development of Roman architecture, however, did not remain limited to these new forms and materials. An unrelated process of architectural innovation continued unabated, which, although less conspicuous, proved their usefulness for solving structural problems and found their way permanently into Western architecture, such as the lintel arch, the independent corbel, and the metal-tie.